"Cozy areas, including soft furnishings and toys, support caregivers and children in engaging in quiet, reflective or relaxing activities." Beginning and Beyond Child Development Center designed spaces within their classrooms that allow for children to sit, read, and partake in quiet activities. They did this by using toddler sized furniture, low to the ground bookshelves with appropriate age level books and a small table. 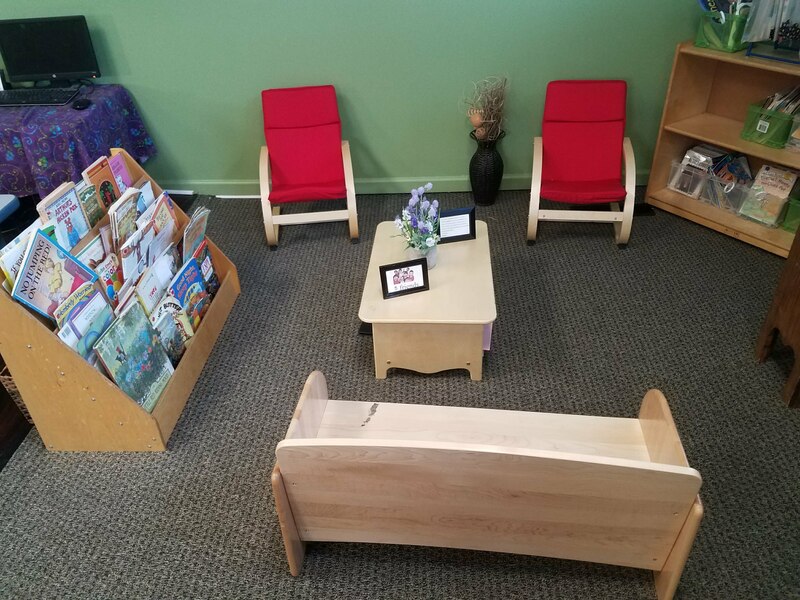 By positioning the furniture around the small table, they created a quiet, cozy reading center, perfect for a child or multiple children to sit, read, and relax. In addition to these quiet spaces, they repurposed and enlarged an existing room to create a therapy room. The therapy room is now being used as a place for children to relax when they need a break, for teachers to provide one on one support, and for therapists to have a dedicated space to work with the children. Creating cozy areas can be fun and easy. Here are some quick steps to creating a cozy space of your own! Identify the location. It could be a corner of a room, a shaded spot under a tree, inside an indoor tent. You decide what works best with the space you have. Pick out some soft furnishings and toys to really make the spot you chose feel intentional. Does the floor need an area rug? Pillows, a bean bag chair? Maybe some plush animals to cuddle with. If you are outdoors, how about an outdoor rug and outdoor cushions? Add some books and other quiet time materials you may have around. Your cozy area can be themed or have color. It should be age appropriate for the children that will be using it. Check out our Pinterest Page for more ideas and themes! Want to see real life examples? Beginning and Beyond features elements of all 5 Best Practices. Check out the space! Schedule a visit!